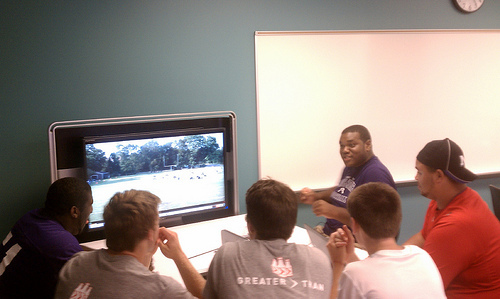 This past Tuesday, we opened our newly transformed Upper School (High School) building. One of the hallmarks of the new building are the four media:scapes we have in various locations around campus. Today, on Saturday, I came on campus so that I could spend some time catching up on the variety of different projects which did not get completed since so much time was spent troubleshooting and adjusting various aspects of the network and technology. What I did not expect to see when I arrived was a group of football players with one of the coaches. 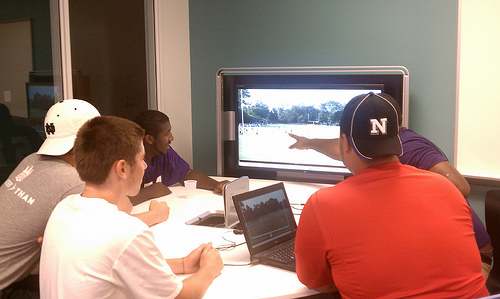 They had come in to review some film from yesterday’s 41-21 victory. I also did not expect them to be using the new Steelcase medi:scapes for this purpose. It was a wonderful use of the media:scape, five players and one coach situated around a large screen display with a computer which had access the the game films. The student athletes were discussing various plays with the coach instructing them, pointing out both times when the student athlete was meeting the goals and when there was something that would need work in the future. There was room (and a surface) for the players to take notes. I have included two pictures of this session. This was not how I expected the media:scapes to be used, but nonetheless, still a great example of how they can be used for learning, even if the focus is athletics. A coach and a small group, learning and sharing.